1. 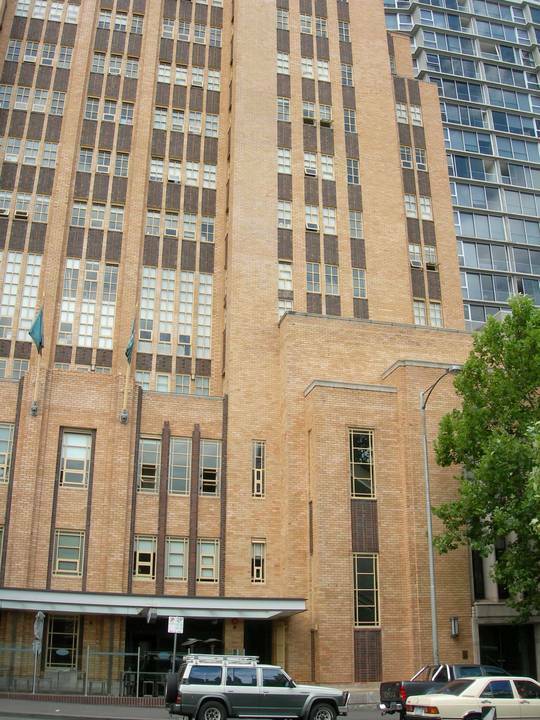 The building known as the Police Headquarters, Russell Street, Melbourne marked B-1 on Plan 600006A endorsed by the Chairperson, Historic Buildings Council and held by the Director, Historic Buildings Council. The former Police Headquarters Complex was built in stages between 1940 and 1943 to the design of Public Works Department architect Percy Everett. The construction is reinforced concrete with face brick curtain walls on a plinth of Mt Difficult sandstone. Mainly cream bricks were used with salt-glazed manganese brown bricks in spandrel panels below the windows. The windows are metal framed and their narrowness emphasises the vertical accent of the complex. The main facade is symmetrical, with central vehicle and side pedestrian entrances. The headquarters building comprises a four storey podium building. This was originally of three storeys but the extra storey was added in 1959. The thirteen storey tower is crowned by a metal radio mast. The ground floor entrances are surmounted by deep stone vertical fins. The multi-storey building at the rear of the main tower was added in 1970 and does not form part of the registration. The former Police Headquarters Complex is of architectural and historical significance to the State of Victoria. The former Police Headquarters Complex is architecturally significant as a rare, surviving example of an early stepped geometric New York or Los Angeles style skyscraper, with brick-facing, in which the combination of radio mast and building form epitomises architectural design of the 1930s. The buildings are also significant for the relatively early moderne style of the ground floor foyer. The police headquarters are historically significant as the last major stage of law and order development in the Russell Street precinct. The headquarters building was for some time one of the tallest and most visible buildings in Melbourne and was readily identified by Victorians as symbolising the law and order within the state.